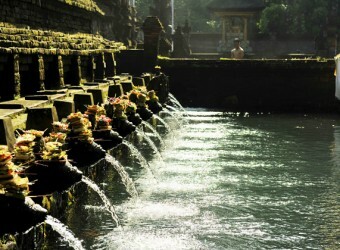 Tirta Empul is the important temple for Balinese who believe Bali Hinduism as the holy spring. Also, it is the ruins of Warmadewa Dynasty prospered in 10~14th century. It locates in Tampak Siring, and there is the holy spring gush out sacred water, which has effect of healing diseases. The sacred water still gushes out from the bottom of spring with blowing sand and small stones. When I heard that this temple is a power spot, I asked the guide and driver to take me there. Holy water spring! I tried to drink it…! I was worried that I will get stomach ache but I was just fine and even I felt good.